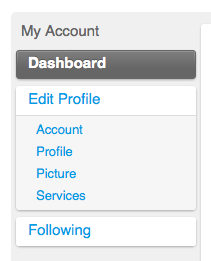 Our last blog post announced our redesign of the Edit Profile pages where you manage your IntenseDebate user account. We’ve continued to make our way across other pages in your IntenseDebate.com account, and we’re pleased to introduce our latest redesigns of your account Dashboard and Following pages. Your Dashboard has had an overhaul and a bit of a face lift to match the new design style, while the Following page has been reorganized and is now easier to maintain. One of the most noticeable changes to the layout is the sidebar. We’ve added additional tabs to the sidebar for your Dashboard and Following pages, which we think drastically improves ease of navigation. This is a theme that you will continue to see as we set our sights on your blog admin pages. The coolest part about our redesign is that this is giving us a chance to cleanup and update our CSS and other background code, which fits in with our future plans for localizing IntenseDebate.com. We have just begun our localization project for the comment section interface, so localizing IntenseDebate.com is a longer-term project. Keep an eye out for another localization progress update coming soon. We’re rolling this out slowly to minimize shell-shock that normally accompanies major interface changes. 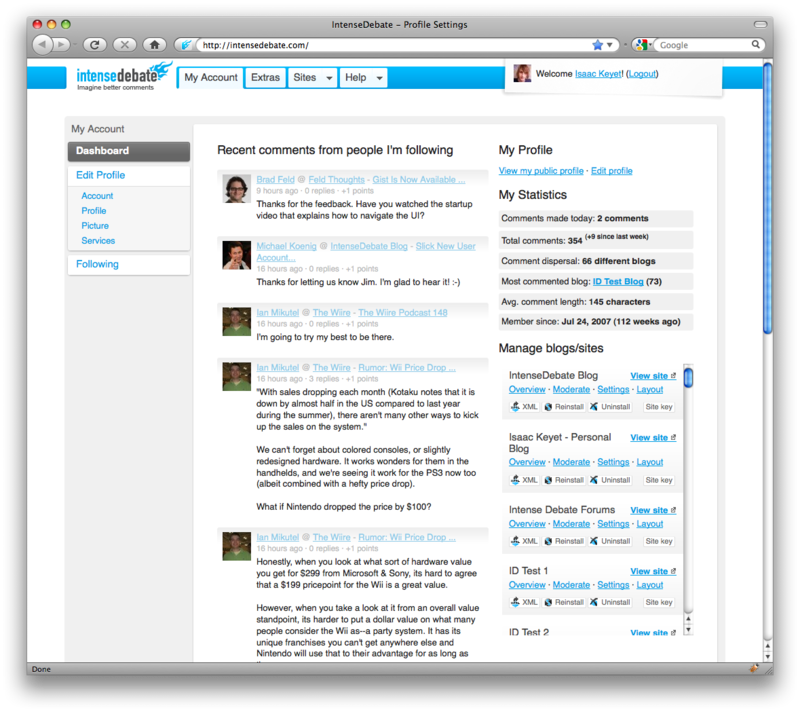 We’re always interested in feedback, so let us know what you think about the redesign. How about a way to delete the comments in the spam folder? This way we don't have to check it as often to see if something slipped through the cracks. 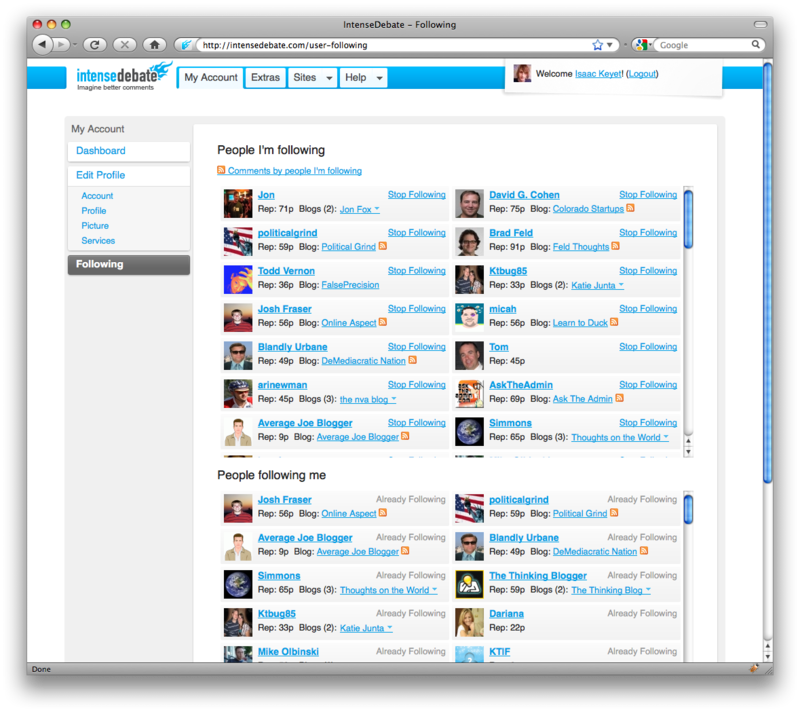 Hmmm, in Firebox on my laptop there only seems to be one row in the following screen, instead of two (like in the pic). On a 15.4 inch screen should there be 2? Can you try zooming in with your browser? Let me know if that does it. I'm digging the new look. Did notice something funky tonight. If I click into one of my sites, and then click on Settings I get the new Setting pages with the left rail navigation. While this is a HUGE improvement, its missing the top nav for me to be able to stay within that site to moderate comments, plugins, tools, etc. You're right, that was weird. I pushed an update to alleviate the navigation problems. Thanks for the headsup, much appreciated. Awesome! Thanks for knockin that out so quick.